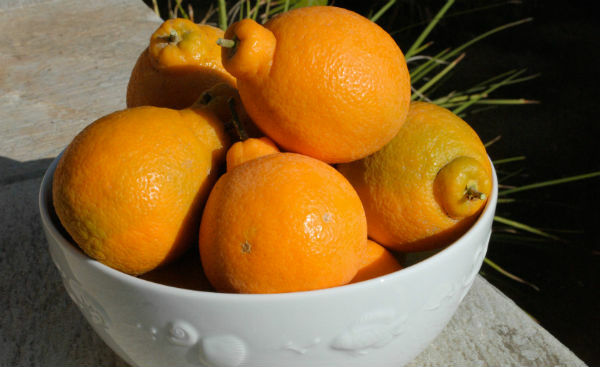 It is citrus season in the desert of Southern California. The fragrance of citrus flowers wafts through the dry desert air and intense sunshine provides instant mental relaxation when you arrive and step out of the car. The last few years I have planted 3 Pink Coachella grapefruit trees, 2 Mineola Tangelos, 1 blood orange, and several lemon trees as well as 2 lime trees at our weekend retreat. By the way if you have never had the chance to try a Pink Coachella grapefruit, it is bar non the best, nothing in the store from Texas or Florida can beat it since they have bred the subtle balance of sweet with sour citrus out of the fruit. Pink Coachellas are juicy, tart, and intensely flavored. They ripen and are ready to pick usually from December to March. 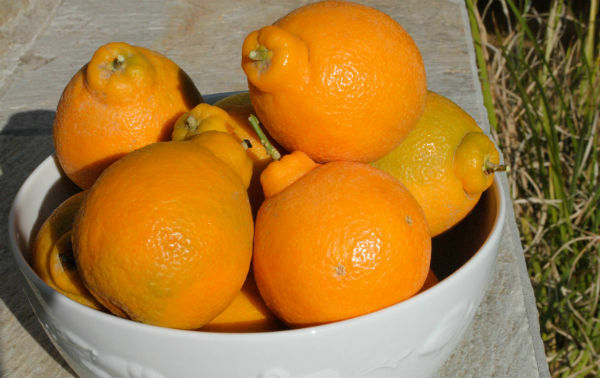 I really want to talk about Mineola Tangelos; they are a grapefruit tangerine cross, that taste like tangerine. 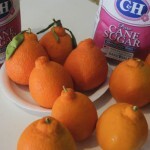 I love to use them in any recipe that calls for orange pieces, juice or rind. 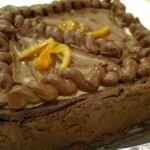 This last week I made Tangelo marmalade. First time it came out ok, then I thought about what I like in my favorite brands of orange marmalade, what makes them so tasty and what texture is the most desirable. Second time around, I used the same recipe but changed the technique with wonderful results. 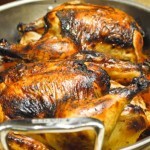 To find a recipe I went on line and browsed through many orange marmalade recipes, from the likes of Alton Brown to Dave Lebovitz and more, looking for technique, ingredients, and measurements. Next, I ordered some cute canning jars on line at Amazon, purchased a 10 pound sack of sugar, and made sure my long chef’s knife was sharp as a surgeon’s blade. Wash and dry Tangelos. Place Tangelos on a large cutting board and slice off navel end with a very sharp knife. 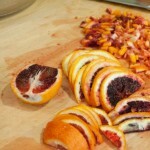 Slice one half of Tangelo across, into very thin strips and then, slice strips in half. Slice second half of Tangelo in thin strips and mince. Remove seeds and place in center of cheesecloth. Cut out any large pieces of white pith from core and place in cheesecloth. Repeat with all Tangelos. After cutting each one scoop up slices and minced Tangelo and place in stock pot. Gather up any juice that leaked out and place in stock pot as well. When all Tangelos are sliced, tie cheesecloth bag of seeds and pith shut and place in stock pot. Add lemon zest and juice to stock pot, then, water. Turn on heat to medium-high, bring Tangelos to a boil. Boil for ten minutes, stir, and continue boiling for another 40 minutes on medium-low with the lid on. Place lid on stock pot, slightly ajar for steam to escape. After 40 minutes are up, add sugar to marmalade (I use C & H brand). Stir in sugar and continue to boil. At this stage, continue to cook Tangelos and sugar until they reach 223° F or Threads stage on candy thermometer. 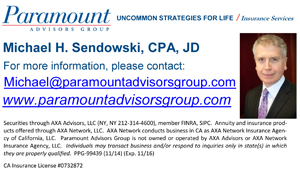 This is not a quick process. 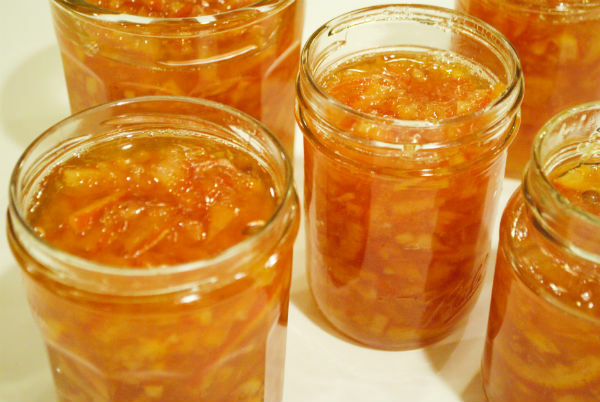 At first the temperature rises rapidly and then, seems to hover forever before creeping up to 223° F. Keep an eye on marmalade while you do other things in the kitchen. You may stir very gently with a wood spoon occasionally. When the correct temperature is reached, remove stock pot from heat and place on counter. 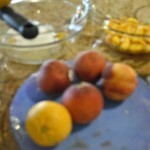 Wait a few .moments; stir and using a wide mouth funnel pour marmalade into prepared jars. Be careful, marmalade is very hot and molten sugar burns. If you want to actually can marmalade you will need to boil jars and sterilize lids, it is a special procedure. Since this is only a small batch, I just close my jars when cool and store in the refrigerator for several months. 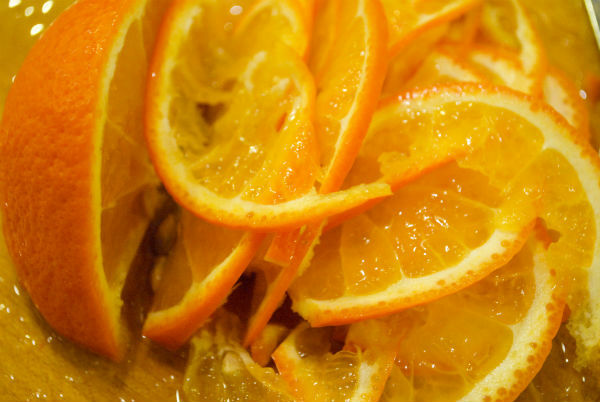 Marmalade is fabulous on Challah toast or English Muffins or layered into a torte or the ultimate, with fresh scones.